Joey Logano finished last in Saturday's Budweiser Shootout at the Daytona International Speedway after his #20 Home Depot Toyota was involved in a multi-car accident on lap 4 of the first 25-lap segment. The 18-year-old rookie struggled with his car’s handling in practice, then had to give up his 19th starting spot after missing the driver’s meeting. Logano missed the meeting as the ARCA race, in which he finished 2nd, was delayed by several wrecks. In the Shootout, Logano was still at the back of the pack when David Ragan broke loose in turn three on lap 4 and collected several cars. The wreck caused Scott Speed to spin down the track. 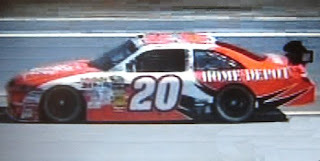 Speed’s nose then clipped the right-rear of Logano’s Toyota, sending him hard into the turn four wall. Logano and the other drivers involved walked away unscathed from this first caution of the race. Although this was Logano’s first last-place finish, it will not be in the rankings as it was not in a points race. Logano’s finish did mark the first time a #20 car had finished last in the Shootout since Jimmy Hensley finished a lap down in the 1990 event. Interestingly, while the #20's previous driver, Tony Stewart, has three Shootout wins, he’s also finished last in two Daytona 500s (2002 and 2007). Next week, Logano will become the youngest driver ever to compete in The Great American Race.